Bord Bia’s SDAS (Sustainable Dairy Assurance Scheme) – As a Primary producer, Coolhull Farm is a fully verified member. Coolhull Farm have committed to a development plan that sets out clear targets in key areas such as food waste, water and energy use, responsible sourcing of ingredients, health and nutrition and social sustainability. These targets are monitored on an annual basis to ensure that we minimise our environmental impact to employees and our Community. 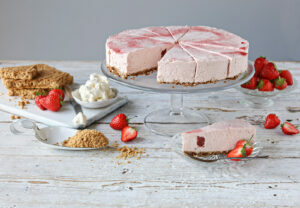 Raw Material Sourcing: We have made significant gains in this area since 2015 when we began making our own cream cheese for our cheesecakes, together with baking our own biscuits for the biscuit crumb. Our NPD team have being doing research and development on manufacturing a number of our inputs which has significant benefits to our sustainability objectives. This has enabled our team to significantly reduce inbound packaging, reduction in emissions in transport and reduction of preservatives creating healthier cleaner labels for our products. Social Sustainability – to develop higher quality employment opportunities and increase community involvement and charitable donations. Health & Nutrition – The development of health promoting products is a worldwide trend. Coolhull Farm won an award at the 2013 Bord Bia Food & Drink Awards for our Protein Ice Cream (Nourish and Perform). Our NPD team are continually creating products with health promoting benefits. Achieving our Sustainability goals is good for the environment and our business.